The Dog Food Advisor\’s unbiased dog food reviews and dog food ratings searchable by brand or star rating. Find the best dry, canned or raw food for your dog. Wish your dog could live forever? Well, forever might be a stretch, but you can often add years to a dog’s life just by taking a more holistic approach to your canine companion’s care. Even small changes can make a huge difference and can even save you money. I modified my own dogs’ care after two years of research and interviews with top experts taught me that many dog care “truths” are really myths, outdated information or commercial propaganda. Commercial pet food is fast food. It can legally contain “4-D” meat (from dead, dying, diseased and disabled animals) as well as corn contaminated with high levels of pesticide. And did you know “complete and balanced” means minimum, not optimum, nutrition? Dogs given a balanced diet of wholesome fresh foods have the best chance for longevity. If you can keep yourself healthy, you can easily learn how to feed your dog for optimum health. Stress kills, and your dog may be under more stress than you realize. Loneliness, confinement, insufficient exercise, obesity, impure water, excessive noise, extreme temperatures and tormenting by family members (human and otherwise) are all possible sources of killer stress. Because of their shorter life spans, dogs succumb to the effects of stress much faster than we do. Step 3: Just Say No! Most of us over-vaccinate our dogs. We give the wrong shots and revaccinate too often. The result can be autoimmune dysfunction, allergies, organ damage and even death. Did you know your adult dog may already have lifetime immunity to the most important diseases and that there’s a simple way to confirm it? Canine cancer is epidemic, and not just in older dogs. Because some cancers are linked to toxins, select safe floor and carpet cleaners, herbicides and fertilizers. Products unsafe for children are unsafe for dogs. Spay or neuter your dog and schedule a vet exam and blood test yearly–twice yearly for older dogs. Wash pollutants off your dog’s feet after walks on public lawns and grimy roads. Always investigate sores that don’t heal, lumps and swelling, unexplained lameness or weight loss, bleeding from orifices, and other mysterious physical or behavioral changes. How long, and how well, your dog lives is largely up to you. A little education coupled with timely action can give your dog the best shot at a safe and healthy life! Jan Rasmusen is the author of Scared Poopless: The Straight Scoop on Dog Care, 2006 Ben Franklin Award Winner for the “Best Health Book” of any kind. Sign up for her free newsletter at http://www.Dogs4Dogs.com. White Oak Golden Retrievers dedicated to the health of dogs. Please visit this wonderful website and learn how to take control of your dogs health and help them to live long healthy lives. our new member of the family, that she was so passionate about her dogs. up another puppy from someone else, two weeks previous to getting him. dogs. I could go on and on about how wonderful he is. Can Dog Breeding Practices Be Changed? The Practice of In-breeding and Line-breeding in purebred dogs is discussed in a much-needed article in “The Bark” magazine, September-October issue. The article entitled; Breeding Paradox; Can dog breeding practices be changed? by John Woestendiek. 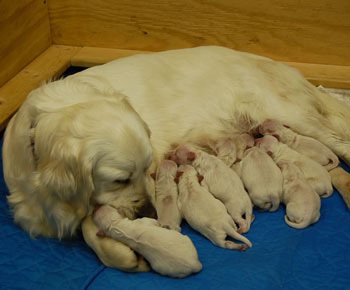 Many breeders today in the United States practice in-breeding and line-breeding in all breeds. It has caused an ocean of health problems in every breed. Some breeds have passed the point of being saved due to genetic disorders from this practice. Still many breeders, dog clubs, dog registries, etc. put their head in the sand and pretend it is not happening. Instead they boast of health clearances and sell bold guarantees on the health of these puppies/dogs. The public is unaware. No one can give a clearance for health on any dog/puppy that has been in-bred or line-bred. Generations of these practices is a nightmare for the dogs/puppies that have to endure the health problems and their owners that do everything in their power to save them. It’s time to demand from the AKC, dog clubs, dog registries and breeders that these insane practices of in-breeding and line-breeding be stopped. It would the greatest loss we as a people ever endured if we lost the Golden Retriever and other breeds that we all love. It’s happening NOW! 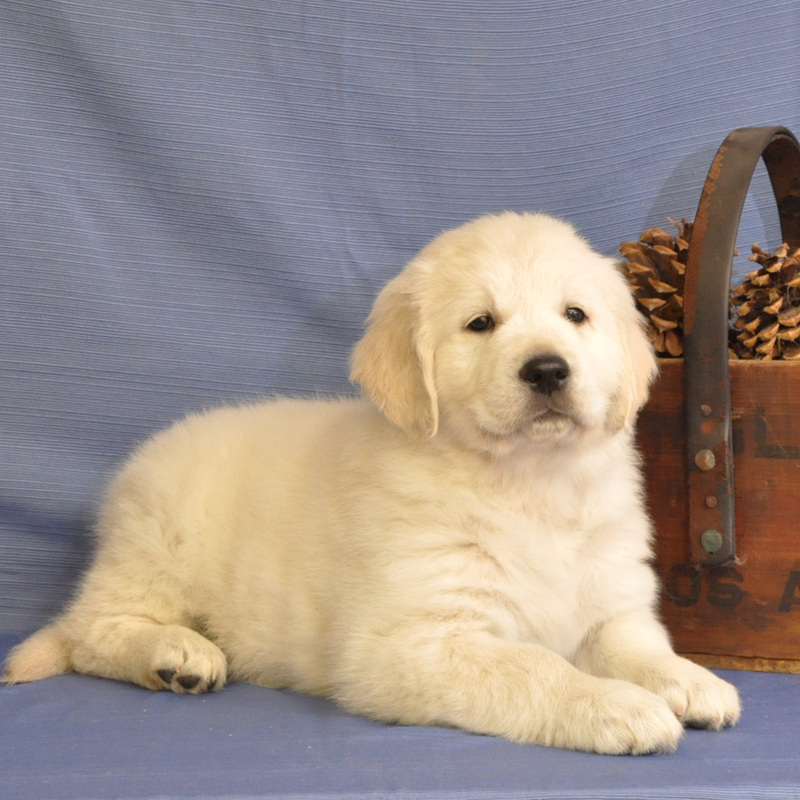 White Oak Golden Retrievers has clean lines of goldens and we do NOT in-breed or line-breed. 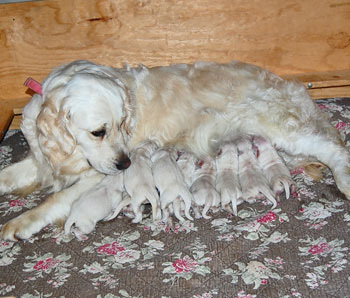 We have a very healthy line of puppies that we offer to good families across America. Pick up a copy of “The Bark” today. This current issue also has a great article on diet written by the Editor in Chief; Claudia Kawczynska. If you have a dog; you need this info.